Rat cortical neurons (RCoN) are derived from cerebral cortices of day 18 embryonic Sprague Dawley rat brains. When cultured under the recommended conditions, RCoN arborize and form complex neurite network in one week. RCoN Stain positive for β III-Tubulin. 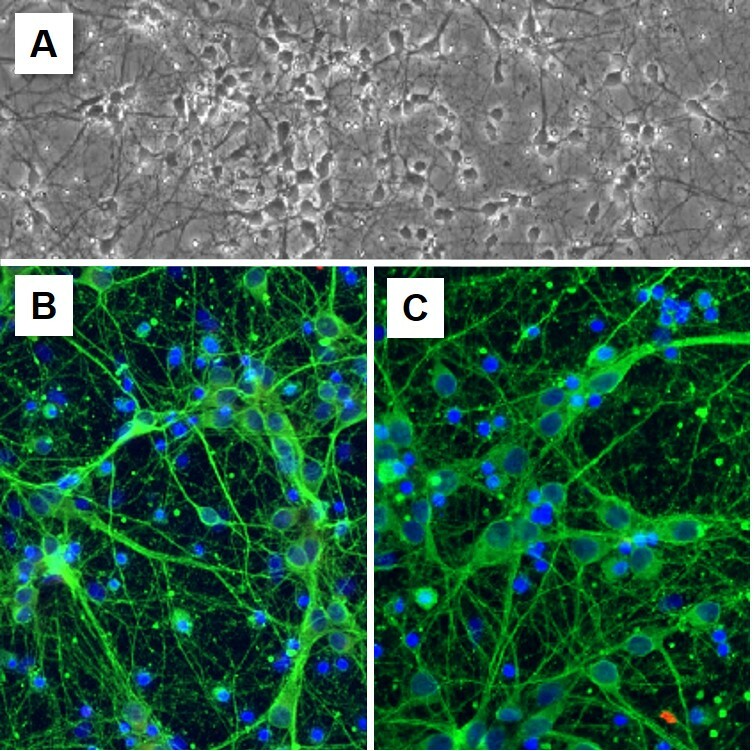 Rat cortical neurons are available in multiple formats, including cryopreserved neurons, freshly isolated primary neurons in suspension, or pre-plated cultured neurons. (Click to Enlarge) Freshly isolated Rat Cortical Neurons (RCoN) cultured for 5 days (A). Freshly isolated RCoN (B), and revived cryopreserved RCoN (C) stained on day 8 for β III-Tubulin (green), GFAP (red), and DAPI (blue).